Debi Kilb, Scripps/UCSD lead for the Quake Catcher Network. WANTED: Members of the public willing to help scientists capture key seismic data to improve scientific understanding of earthquakes, provide detailed information on how they shape Southern California and aid earthquake emergency response efforts. This call for help comes from members of the “Quake Catcher Network,” a collaborative project sponsored by the National Science Foundation in which earthquake scientists around Southern California enlist volunteers to deploy small, easy-to-install seismic sensors in their homes, offices and other locations that have a computer with Internet connectivity. The project is conducted by scientists at Scripps Institution of Oceanography at UC San Diego, California Institute of Technology, Stanford University, UC Berkeley, University of Delaware and the U.S. Geological Survey (USGS). Current networks of seismic sensors have given scientists a picture of earthquake activity in the region, but with the potential of adding up to 1,000 additional Quake Catcher Network sensors through volunteers in Southern California—especially in key areas surrounding potentially damaging faults where seismic hazard is high —the picture will become more vivid and high-resolution. The Southern California Seismic Network and the ANZA Seismic Network currently operate a network of nearly 350 and 25 stations, respectively. These stations are held to very high standards to ensure reliable life-safety earthquake monitoring. “A second aspect of the project is to instrument buildings so that engineers can monitor the response of the buildings to strong shaking from an earthquake, wind gusts, large-scale construction, traffic and other sources of vibrations,” said Monica Kohler, a senior research fellow in mechanical and civil engineering at Caltech. 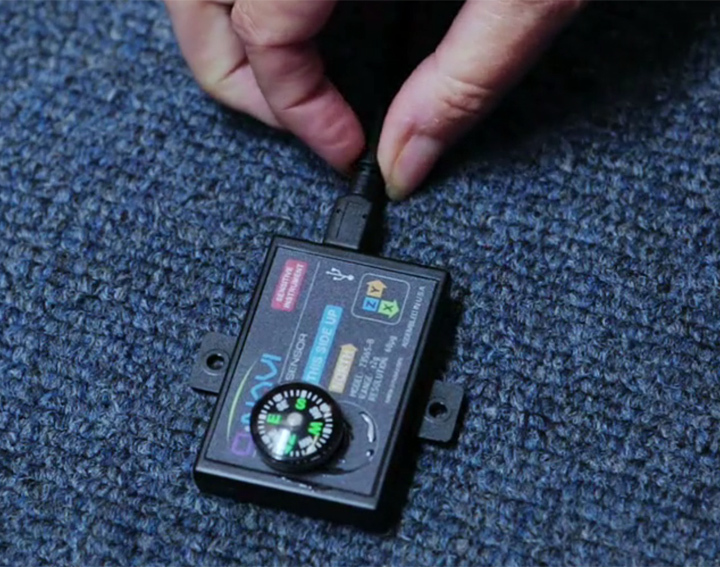 “It is essential to install seismometers on multiple floors in buildings in order to get a clearer look at how they shake. We need the public’s help with this simple solution,” said Kohler. Quake Catcher Network sensors—free to volunteers in target regions —are lightweight and about the size of a Post-it Note. Although anyone is welcome to participate, project organizers are seeking volunteers located in target areas where the need for sensor data is highest. Other requirements include an appropriate computer that is on preferably 24 hours a day, Internet connection, a spare USB port and the ability to securely fasten the sensor to the floor near the computer. Those interested in participating should visit qcn.stanford.edu to read more about participation requirements. Sensors and educational software also are available to K-12 teachers at a nominal charge of $5. 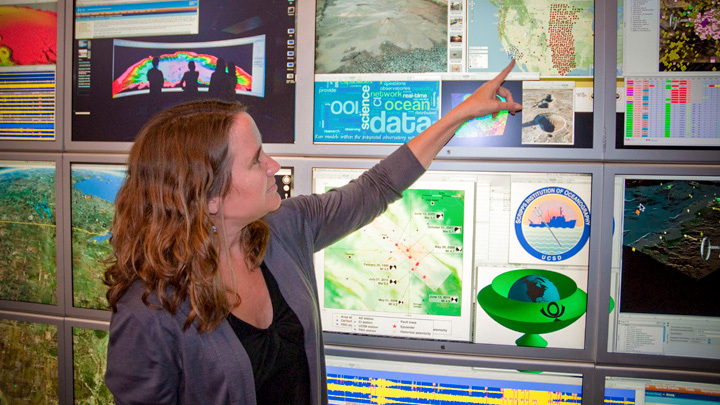 The idea for the Quake Catcher Network, which is building the densest network of seismic sensors ever devoted to studying earthquakes, was conceived at Scripps Institution of Oceanography by Elizabeth Cochran and Jesse Lawrence while they were post-doctoral researchers in Scripps’ Cecil H. and Ida M. Green Institute of Geophysics and Planetary Physics. “We are very excited about integrating these new sensor technologies into existing regional networks with the hope of very rapid earthquake detection, detailed earthquake rupture imaging and improving understanding of seismic hazards,” said Cochran, now a research geophysicist with USGS. 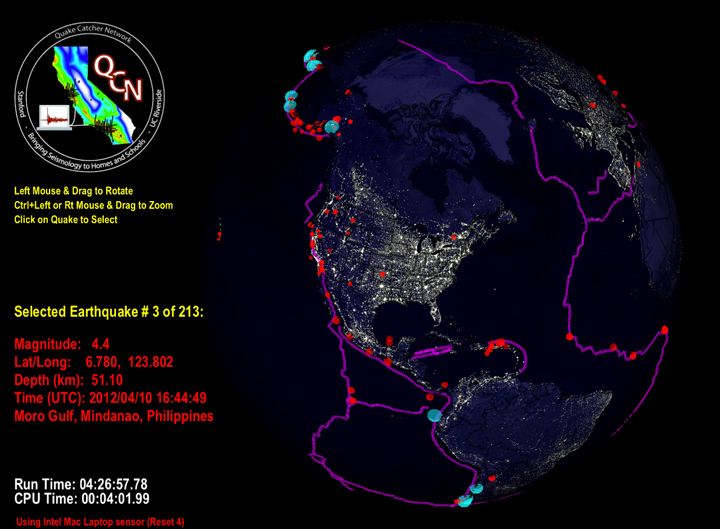 Roughly 3,000 Quake Catcher sensors have been installed around the world and have recorded earthquakes ranging from a 2.6 magnitude quake in New Zealand to the 2010 8.8 earthquake off Chile that is recognized as one of the largest events in recorded history.